Handy Handout #177: What is Aphasia? Aphasia is a neurological language disorder that impairs a person's ability to use and/or understand words. Impairments may include deficits in the ability to speak, understand speech, read, and/or write—but aphasia does not affect one's intelligence. Aphasia may occur after damage to the part of the brain where we organize, store, and produce written and spoken language. Although aphasia is more common among older adults following a stroke, aphasia can occur across all ages, races, nationalities, and genders. Acquired childhood aphasia occurs when a child whom has already begun learning language experiences brain trauma. More than 100,000 people each year get aphasia. It affects 1 in 250 people and is more common than cerebral palsy, Parkinson's disease, or muscular dystrophy. There are many types of aphasia. Some individuals have difficulty speaking; whereas, others may struggle to follow a conversation. Cases may be mild, severe, or anywhere in between. Symptoms may differ greatly, but the bottom line is that all people with aphasia will have some difficulty communicating. The symptoms of aphasia may be temporary or permanent, depending upon the amount of brain damage a child experiences. What are Some Strategies for a Child or Adult with Aphasia? Use computer programs to aid in speech, hearing, reading comprehension, and recall. What Can I do to Help a Child or Adult with Aphasia? Give the person with aphasia time to speak—do not try to finish his/her sentences. Turn off background noise when possible (TVs, radios, etc.). Use other means of communication (drawing, gesturing, or writing key words). Confirm to the person with aphasia that you understand their communication. Speak simply and directly—you do not need to shout. Limit the use of figurative language. Ask yes/no questions whenever possible. Avoid using numbers; they are difficult for some aphasia patients to understand. 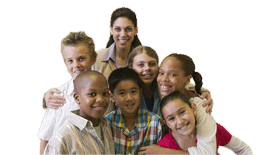 Children with aphasia and their caregivers need support and guidance. Physicians and hospitals can provide listings of support groups in your local area. The best source of basic information about aphasia for those living with this condition and their families is the Response Center of the National Aphasia Association (NAA). Contact the NAA via the internet: www.aphasia.org or call toll free at 1-800-922-4622.